A small plane has collided in mid-air with an F-16 fighter jet over South Carolina, killing two people and sending debris into a mobile home park. 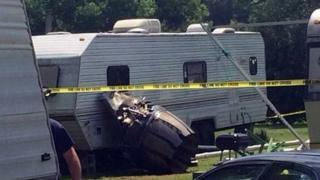 The National Transportation Safety has launched an investigation into the crash. Military jets from Shaw Air Force Base, outside of Columbia, routinely fly training missions over eastern South Carolina and the Atlantic.